No. 1 University of Florida defeated No. 21 Florida State, 4-3, in nine innings Wednesday evening in front of 2,398 fans, the second largest crowd in the history of Katie Seashole Pressly Stadium. Junior Francesca Enea hit a walk-off home run, the second for the Gators in the last three games, to give Florida its 40th win. Sophomore Aja Paculba led the way for the Gators (40-3, 18-1 SEC) with a 2-for-4 performance, tallying one run. Senior Stacey Nelson improved her win total to 24 after coming in late in the game. Nelson earned the victory after relieving sophomore starter Stephanie Brombacher. Reliever Terese Gober (18-8) took the loss for the Seminoles (29-13, 5-4 ACC), giving up two solo home runs late in the game. Kaleigh Rafter tied the game in the sixth for Florida State with a two-run homer. Then Michelle Snyder gave FSU a one-run lead with a solo home run to left field in the top of the seventh. Florida, however, would strike back in the bottom of the inning. With two outs, sophomore Megan Bush hit a solo shot to left center to tie the game, 3-3. Head coach Tim Walton went to Nelson in the top of the eighth inning with one away. 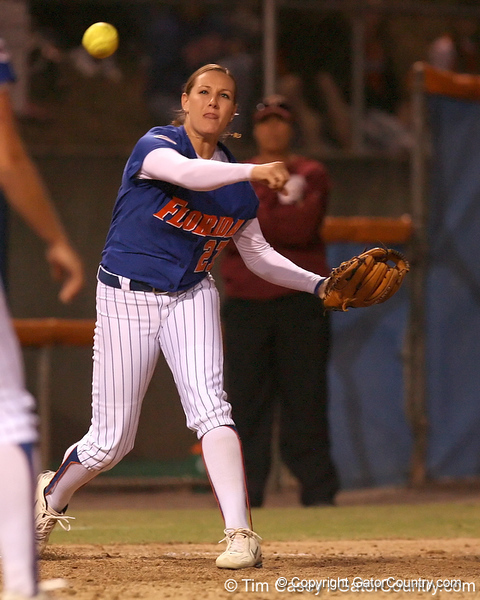 Nelson retired five of the six batters she faced to give the Gators a shot to win in the bottom of the ninth. Enea led off the inning to hit a walk-off home run to lift the Gators over Florida State, 4-3. The long ball was the 35th of Enea’s career, just one shy of tying the school record. Brombacher struck out seven and walked only one while allowing seven hits and three earned runs in her 7.1 innings. Nelson allowed one hit and struck out three in her 1.2 innings of relief. Florida junior third baseman Corrie Brooks throws out a runner at first base during the ninth inning of the Gators' 4-3 win in nine innings against the Florida State Seminoles on Wednesday, April 8, 2009 at Katie Seashole Pressly Softball Stadium in Gainesville, Fla.